The e-commerce bubble in India really took off sometime around 2011. The transition to buying online was slow, and people didn’t trust the Internet enough to spend their money through a screen. But nevertheless, the traditionally curious Indians’ fascination with online shopping didn’t abate, and so they settled on one commodity to test the waters for this platform: books. Suddenly, there was this phenomenon of kids in my school walking in with rare copies of comics, the latest Diary of a Wimpy Kid novels and books that hadn’t hit the shelves of the traditional bookstores. Seven years, 30 sports books, one high school degree and a college acceptance letter later, I can still say it is the best autobiography I’ve ever read. I must have read the book easily a dozen times. The book became like a Bible of sorts for my group of friends and passed through more hands than I can even count. By the time it was finally returned to me, some of the pages had stains, the cover was bent and the picture pages were just not there. That book still holds a special place in my bookshelf. There’s one chapter in particular — “The Long and Winding Road to Istanbul” — that I practically know by heart. It’s a 30-page journey into the 2005 Champions League final through Gerrard’s eyes, and it gives me goosebumps each time I read it. Even the staunchest Evertonian would feel this tingling of emotion in him if he read it. It’s just pure passion. I knew I had to get a Gerrard jersey after reading the book. I ended up buying the Gerrard No. 4 England one. I couldn’t betray North London, after all. 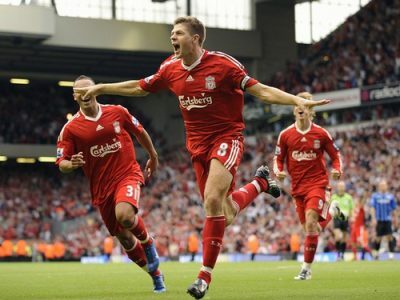 God, how I craved for a captain figure like Stevie G at Arsenal. But alas, I settled for Thomas Vermaelen and watched Merseyside wistfully. Wearing my No. 8 Mikel Arteta jersey, I’d do the classic knee slide celebration of THE No. 8. A lump formed in my throat after seeing Arteta tear up at Anfield after they inched one step closer to the title in 2014. I knew I’d never hear the end of it if Liverpool actually won the league from their fans, but this small part of me really wanted them to win it. Just for Stevie. When he slipped, I laughed, and then I cried. I spent the rest of the second half on the edge of my couch praying he’d pop up on the edge of the box and pop one home. At full time, I was filled with this heaviness that I still can’t quite explain. If it had been anyone else who’d have slipped, I’d be forwarding all the ‘don’t let it slip’ memes and jokes, too. My reticence after the game was out of respect, twinged with a dash of dismay. My relationship with Gerrard has always been a weird one. Hands down, he’s my all-time favorite player, but it’s a love I’ve had to keep secret because of club loyalties. When he left Liverpool, I was actually relieved. I ordered a Gerrard LA Galaxy poster soon after. Five years on from the slip, Liverpool is six games away from possibly winning the Premier League. Dare I say it, but I’d actually love for them to win the league. For Stevie G. The league title will at least help put some of his ghosts from that fateful afternoon in 2014 to rest. Please Liverpool, don’t let it slip now. Written from the heart. Moving and powerful.